The perfect bedroom for a child should be stylish but practical and comfortable at the same time. Create a room that is a vast canvas for the things that a child loves. Children's rooms need to be carefully planned to make the most of the space available. The room also has to grow with the child. Nowadays furniture shops like Otobi and Furnifun produce furniture for children's rooms and often have the perfect pieces to suit specific needs. Decorative schemes for a child's room can be a huge headache as well. They need to be stimulating yet have a calming and tranquil atmosphere at night. The furniture selection has to be functional and safe for the child. It is important, for children to have a space of their own, where they can play without fear of breaking or knocking over fragile or valuable things. 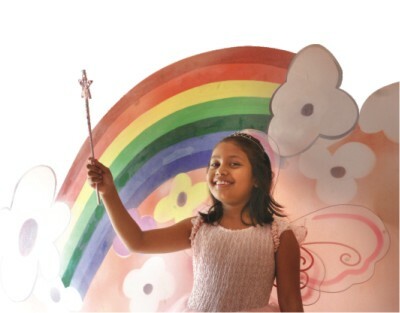 Nukrat is a seven-year-old girl with a dream of having her own beautiful room. The owner wanted Nukrat's room to feel like one was stepping into a sweet dreamland. Her favourite colours are pale blue, magenta, and pink and they wanted to work with that palette in the room. Nukrat's room is the picture of femininity with curved muslin drapes & maroon embroidery sheers. The curtain pole ends and curtain rails also give an antique look. Pink is a popular choice for a little girl's bedroom and we used light pink for the walls. Artist Anukul painted a rainbow on the wall. This is an exciting backdrop for a fairytale bedroom. Bright lighting highlights the room very well. Generally if someone has two children, bunk beds are space saving. Often children will have to share a room due to lack of space. Bunk beds are an extremely practical solution to this problem. The type of bunk beds should also be chosen carefully for safety. Fortunately, Nukrat is an only child. And thus her bunk beds act as a sleeping place for her as well as her toys. We used a pink floral bed cover and pillows to add to the fairy tale look. Once children start school, their rooms start to have a dual-purpose as bedrooms and study areas. Thus ideally a desk should be incorporated into the furniture plan, so that there will be adequate work surfaces for reading and writing as well as playing and painting. We wanted Nukrat's room to suit all purposes and accordingly placed a small dressing table, a stool and a small reading table across the bed. 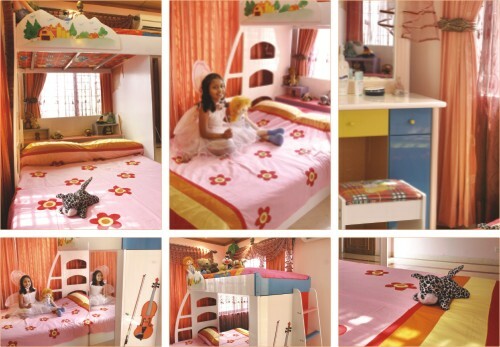 In a child's room, parents and designers always face the challenge of balancing the child's wishes with functionality. The perfect child's room is one that reflects his/her imagination and satisfies functional and organisational requirements as well.